Beautiful Ocean View House - 2BR 2,5 BA with privat Pool. 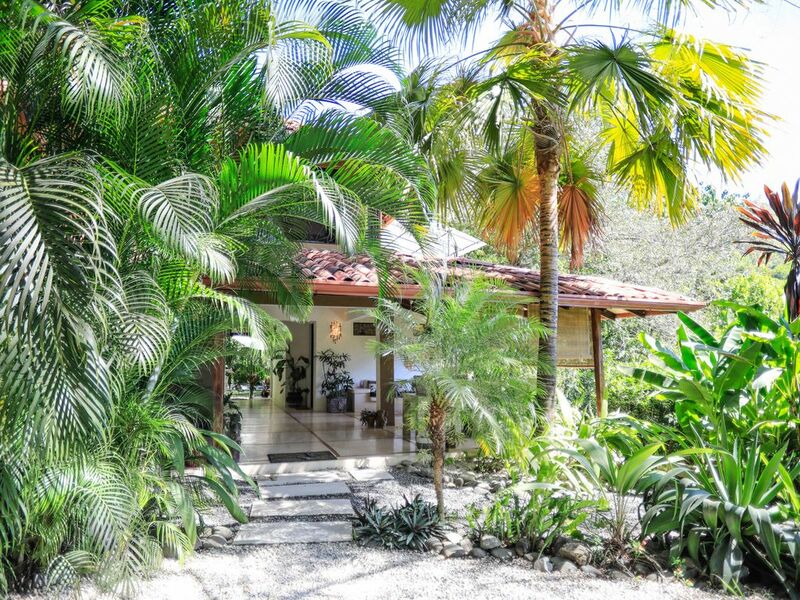 Casa Sol y Sombra is a modern tropical construction, with spacious inside and outside areas to sit back, relax and unwind. The house boasts beautiful ocean views all the way to the Cabo Blanco National Park. Morning sun, afternoon shade and endless cool breezes. Thus the name Sun and Shade. The master suite on the second floor has a full bathroom, a private ocean view balcony and living area. The guest bedroom is located just of the open living area with a full bathroom and garden view. The location of Casa Sol y Sombra is outstanding. Located just a few hundred meters and within easy walking distance to the village, and yet a haven of peace, tranquility and nature. The house has a private gated entrance way and is surrounded by a big lush tropical garden, giving the house and pool complete privacy. The pool and garden blend into the forest, providing a beautiful oasis of calm. You will see incredible wildlife – birds, howler and white face monkeys, iguanas pass by on their daily routine and you often see little tucans having a bath or drink at the buddha garden fountain. A perfect house for families with kids, specially with teenagers who like to explore a bit on their own. Also a wonderful romantic get away for couples. We are happy to help with your vacation plans and also are at your service to assist you with any activities and needs while staying with us. cement floor and sinks with local wood details. the house is near the ocean, a short pleasant walk down the hill to the beach entrance which leads to the white sandy beach of Playa Carmen . Walk down the hill back into the village and enjoy a ton of great stores and restaurants. My favorites-The Bakery, 'Abajo de Arbol'/Under the Tree .. Fish Bar .. Product C.. Super Ronny's Grocery. Wonderful Clean Ocean View over Playa Carmen and South to MalPais tip and Cabo Blanco Reserve. Beautiful Blue Ocean views of the waves crashing on the Beach's and Famous Rock Formations of MalPais. Generous Jungle Hillsides Views to the East of the Property, bring White Faced & Howler Monkeys around, along with an assortment of tropical Birds, Butterfly's, small garden lizards and iguanas. fully equipped with table for two in Kitchen, and a Large Dinning Table sitting with view of Jungle and Gardens. very private pool in a big tropical garden ! Our family of 5 (3 young boys) had a wonderful stay at Sombra y Sol. The howler monkeys and iguanas in the trees were the delight of our children and really reminded us where we were. Siggi is so extremely kind and thoughtful and has created a truly lovely space. We visited in March which is quite warm but with a perfect pool in the shaded back yard we were very comfortable and happy to spend our days just relaxing at the house. We loved getting to know the area and the town of Santa Teresa. We are already planning our next trip back and would stay at Sombra y Sol again in a heartbeat! I have nothing but good things to say about Siggi and her gorgeous home. This alone is the basis of my 5-star rating. Santa Teresa is not for everyone but the negative parts are not in Siggi's control. She went out of her way to make our stay comfortable and fun. Months before we arrived she helped with transportation information (fly domestic or take the ferry out to Santa Teresa), she helped with rental car information which proved invaluable, she provided suggestions on things to do in the area and she was very attentive and responsive when we were there. It was just me and my husband so we had plenty of room. There is a large open air living / dining area and back porch and then the gorgeous infinity pool. Siggi has someone come every day and take care of the pool and garden. The upstairs bedroom is very breezy with windows on three slides and gorgeous screens. There is also a sitting area in the bedroom. My favorite place was the outside terrace deck that overlooks the ocean. There are two chairs out there but also a tanning bed. The best was waking up in the morning with a breeze blowing through and listening to the howler monkeys, birds, and cicadas. The bathroom is big and the shower is very nice with adequate pressure (water comes from a tank and is delivered). Toilets are on septic tank so you can't flush any paper. This is very common in central american countries and does not bother us but for some it may be, well, gross. The soiled paper goes in a covered waste basket so not a big deal. Even at some of the best places in town you can't flush paper. So the fact there the villa had no air conditioning did not really bother us the first few days. But then it got unseasonably hot and the breeze went away and it was uncomfortable. But I just went in the pool and Siggi has fans everywhere! Oh, I also want to mention that Siggi had a big watercooler for water and she left us beverages and fruit which I thought was very kind. Now for the town of Santa Teresa. I'm so sorry do say this was a bit of a let down. The roads are just too bad (unpaved), many pot-holes and you are trying to avoid four-wheelers, bicycles, and people. Its a little scary. Sanitation is not great either so there's often a garbage smell in the air. BUT, the beaches are indescribably beautiful and it is very true that the Pura Vida vibe about the place is contagious. The people are friendly and kind. The food is amazing. It is fresh and tasty. We just finished a truly wonderful week stay at Sol & Sombra. We were two couples and the house was great and we would highly recommend to others. Siggi (owner) was great to work with both before and during our first visit to Santa Teresa. She offered great suggestions for activities, restaurants, etc. We rented a 4WD car for the week (opted out of renting ATVs) and it worked out great. Driving around the area can be a bit adventurous but not a problem for anyone who has travelled some. 4WD definitely necessary both to get up to the house on the short but steep hill from the main road and also for getting to some other areas in Mal Pais and elsewhere. The house location is ideal, being both easily walkable to lots of great restaurants and the beach. We went fishing with Miguel (Mincho) out of Mal Pais and would highly recommend him to anyone interested in doing a 1/2 day of fishing. CURU Wildlife Reserve was also great and while a bit of a drive (hour +) we saw lots of monkeys and other wildlife. We were truly amazed at how great the food was in the local restaurants. Some of our favorites were; The Bakery (really great breakfast), Banana Beach, Habaneros (both on the beach) and Katana. We had a special love of Drift, which serves a wide variety of amazingly good cold-pressed cocktails (including to go liters) and also great tapas while at the restaurant. Ronny's #1 down the hill from the house is a great grocery store. We also had Siggi arrange for a chef for one night (Mariya) and she was a wonderful person and a great chef and we would highly recommend asking if she is available for a night, though all of the restaurants are so wonderful. Beaches were long, wide and stunning. Coming down to watch the sunset with the rest of the town each night was a wonderful experience and one we will not soon forget. People are very friendly and the whole area has a great, low-key vibe. Since it was the dry season, it was sunny and hot everyday. There is definitely a good amount of dust kicked up everywhere from the road, but you get used to it quickly and the house itself is set up on the hill in a truly wonderful jungle setting with a great plunge pool. We highly recommend a stay at Siggi's fantastic Sol & Sombra and enjoy the Pure Vida life. Perfect for 4. Privacy, live outdoors, walk/close to all amenities & great host! One of the Top VRBO Places We've Ever Stayed! Wow! We can’t say enough great things about Sol y Sombra. The owner Siggi has created a beautiful sanctuary that was perfect for us and our 4 teenagers. The entire place has such a wonderful, peaceful vibe. So many things to list that we all agreed made our stay one of the best vacations ever…the view was out of a movie, the house design elements were truly works of art, the perfectly-placed infinity pool was used every morning and eve, the landscaping was amazing along with the wildlife, we loved the open-air environment (there was no need for AC), the house and pool cleanings kept everything tidy for us, the location away from but close to beach and town…and Siggi was the best. We have rented many times with VRBO and we have never had such service and attention from a homeowner. She answered the smallest of ?’s and gave us tons of advice on what to do and where to go…and she was always avail at a moments notice. She made us feel totally comfortable, safe and at home in her beautiful place. The only bad part is that we had to leave! This place is magic! Even after reviewing the photos time and again prior to our arrival we were still amazed at how gorgeous and private Siggi’s place is. It’s a perfect little oasis tucked above and away from the noise, yet close enough to walk to the beach. The house and grounds are wonderfully designed, the garden beautiful, the pool an enchanting little daydream of a place. Siggi is lovely, knows her way around and is super accommodating but lives off the property so respects your privacy. Kitchen and property have everything you need. Highly recommend! "Casa Sol y Sombra", which means Sun and Shade, which it certainly has a good amount of both! You can also add "Peaceful y Quite" for the house sites above the village, tucked in Jungle and Ocean Views, great to Kick back and Relax totally, day and night. Great upper Balcony deck for sunbathing and watching the stars. Private Pool to relax and watch Nature as Monkey's pass by, lots of afternoon 'seista' spots around the house, including day beds and hammocks. The House is also situated perfectly for the Active Adventure Traveler.. super private jungle garden house above the village, steps away from everything Santa Teresa has to offer, including over 50 International Restaurants, Zip Line, SUP rentals, Sail Boat Tour, Fishing Trips, Tortuga Island day Trip, Horseback Riding and much much more.. Being Centrally located is a great advantage for Family's with Teens that wish to explore the area. Right in-between the two great villages of Santa Teresa and MalPais, Surfing Spots steps away, Private Beach's a quick ride or morning walk..
Take a wonderful day trip into the National Park "Cabo Blanco Reserve", where you will surely see every type of Tropical Plant (all clearly identified), and an abundance of Tropical Animals in their natural habitat. We are so fortunate to have a Grocery store that carry's every sort of Import Item for Glutten and Milk sensitive Travelers, as well as a Butcher Shop, Fresh veggies and Local Made Sweets, including Fresh Bakery Breads, Free Range Eggs, and much much more. For Souvenir shoppers you will find an assortment of shops selling local goods to take home to your friends and families.